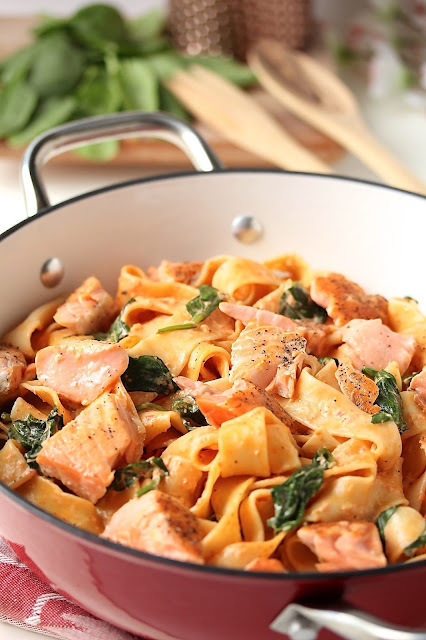 Make quick and easy weeknight dinner feel special with this Salmon Pappardelle in Roasted Red Pepper Cream Sauce. Perfectly pan-seared salmon with al dente pappardelle pasta and tender spinach is coated in a creamy roasted sweet red pepper sauce. This is a home cooked meal to look forward to! There is a cashier at the grocery store I frequent I refer to as "The Eye Roller". Anytime I make a special request, she rolls her eyes. "Could I have that in plastic"? Eye roll. "Please bag the water". Eye roll. You'd think her eyes would permanently be stuck to the top of her eye socket because she rolls them so much. Do you ever get the feeling some people think they are doing you a favor by performing their job? I do! Sometimes I feel that customer service has become a lost art. 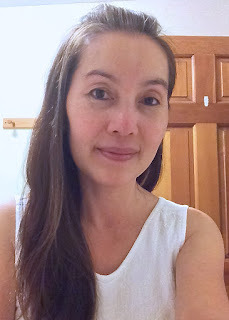 It's to the extent where I am so touched when someone is helpful, courteous, and doing their job well that I'd want to hug them or make them cookies. This salmon dish is a winner guys! It is truly quick and easy, the kind of recipe that I'm relying on for weeknight dinners. With the long-awaited extended daylight hours and mild temperatures, I want to spend more of my time outdoors and less in the kitchen after a day at the office. What this dish also has going for it is it makes a small amount of salmon go a long way. Let's face it, salmon is expensive when compared to chicken and pork. When you can make about a pound of salmon feed four people and leave them feeling full—SCORE!! Why is that? Well, after doing this photoshoot, I made a last minute decision. 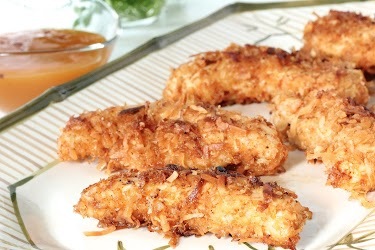 I felt the only thing this recipe could use is a little more sauce because it is so good! I tweaked the recipe and increased the amount of red pepper sauce. As I made the revised batch, it occurred to me that sriracha with its tangy, spicy, and garlicky profile would elevate the sauce even more. And it did! So I added it to the final recipe, which results in a sauce that slightly deeper in color than the original version you see here. I did not conduct a second photoshoot. My tripod has been giving me trouble, and I din't want to spend another chunk of my day fighting with it. If an inanimate object could show subordination, my tripod was definitely saying, "You're not the bossa me"! One thing for sure, I'm going to do a little shopping at my favorite online store at Amazon. I'm determined to have a new tripod that won't yell at me the next time I conduct a photo shoot! And with my Amazon Prime, I will get it with no shipping cost and two day delivery! When I eat Salmon Pappardelle in Roasted Red Pepper Cream Sauce, I feel like I'm dining out. It just tastes luxurious. Pair it with a nice glass of wine and it's a great night! Pat salmon dry. Allow to sit at room temperature for 15 minutes before cooking. Using a food processor or a blender, puree the roasted red pepper. Set aside. Preheat a large skillet on medium high. Season both sides of salmon with a sprinkling of salt and pepper. When skillet is hot, add 1 tablespoon oil. Add salmon, skin side down. Reduce heat to medium. Gently press down of salmon with a spatula for 10-15 seconds to ensure the skin comes in contact with the skillet. At this point, leave the salmon alone. The flesh will lighten in color as it cooks from the bottom up. Cook for 4 to 6 minutes or until the pale color has reached 2/3 way up. Flip salmon over. Cook for approximately 2 minutes or until the sides of the salmon turn almost completely pale. If using salmon steak where the sides are covered by skin, use a instant read thermometer to test for doneness. Insert thermometer into the deepest part. 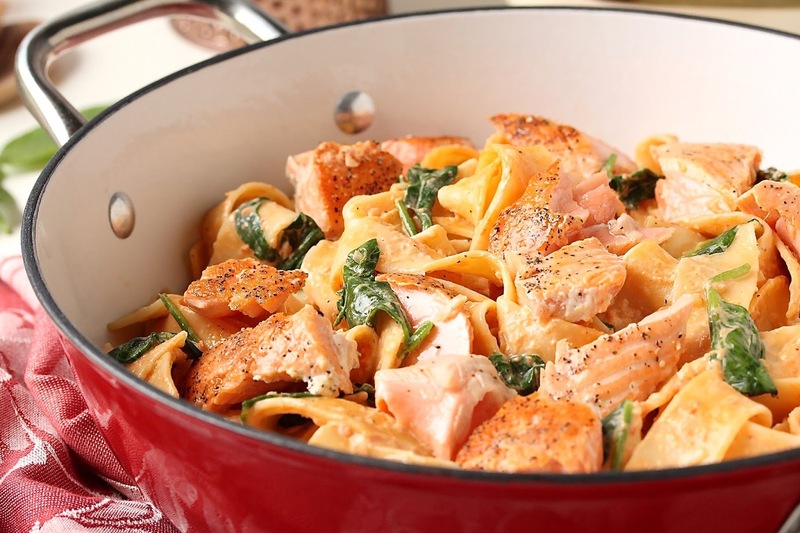 It's done when the temperature reaches 135 degrees F.
Remove salmon from skillet. Allow to rest for 5 minutes. Remove and discard skin. Break into bite size chunks. Set aside. Add pasta to the pot of boiling water. Cook until al dente. Reserve 1/2 cup of water. One minute before draining, stir in spinach. Drain pasta. Bring skillet back to heat on medium. Add shallot, stirring constantly for 2 minutes. Add a additional teaspoon or so of oil if the shallot sticks to pan. Stir in light cream, reserved pasta water, and pureed red peppers. Add sriracha and the remaining salt and pepper. Increase heat to medium high. When sauce begins to bubble, reduce heat to medium low. Simmer gently for 2 minutes. Fold in salmon. Simmer for a minute to reheat salmon. Season with additional salt and pepper to taste, if needed. Return pasta back to the pot. Pour sauce over pasta. Work the sauce into the pasta being careful not to break up the salmon pieces. Serve hot. I have had that thought so many times, about people who think they are doing you a favor when performing their job. Not as much in Germany where I live now, but in my home country, Romania. The worst was when I wanted to buy a chocolate (and was 6 months and very obviously pregnant) and the cashier started screaming at me because the chocolate didn't have a price tag, how on Earth is she supposed to know all the prices and why do I have to pick that chocolate, if it doesn't have a price tag? I have never screamed at a stranger so loud in my whole life... I totally lost it!!! 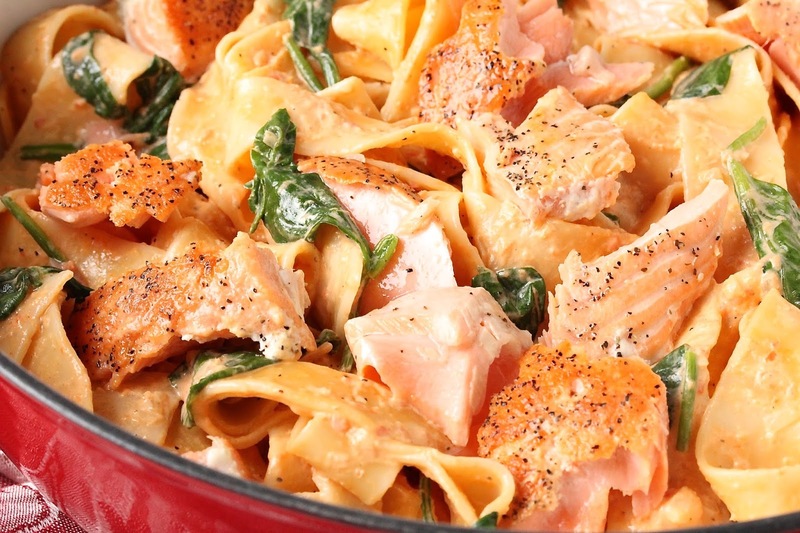 But on a more positive tone: your salmon pasta looks amazingly delicious!!! I hate to say it, but some people don't belong in a customer service job. It's not good for the customers and it's not good for business. That cashier was so incredibly rude to you. I'm glad you gave her a piece of your mind!! Thank you mimi! I ordered my tripod and definitely let you know how I like it after I test it out. Wish me luck! What's with those people? It's almost enough to make me avoid shopping at the store but it woos me back with a large selection and good prices :) You really need to give salmon and pasta try Karrie! It's so good!! ahhh yum!!! 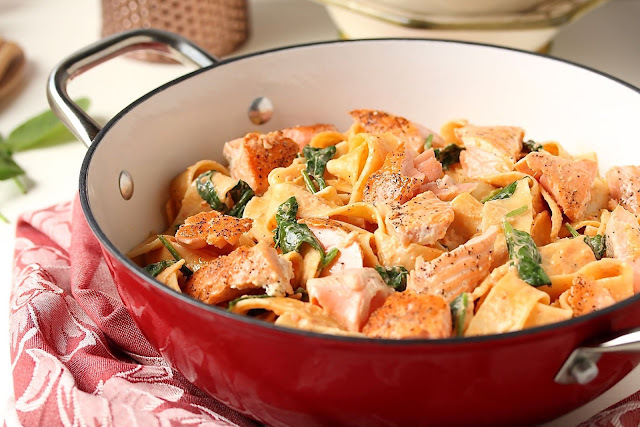 i'm most familiar with smoked salmon in my pasta, but pan-seared salmon also sounds super tasty (: especially with all that creamy sauce! I can totally relate with receiving poor customer service (and getting good service too!). I'm getting hungry just looking at the pictures. What a delicious pasta dish. Thao this sounds so delicious! I am loving that sauce :-) I can't even begin to describe my terrible grocery store experiences! I just don't get it sometimes! Omg yes! There's a checker at Safeway who's so surly I'd rather wait in someone else's line than go right through hers. I always want tell her that life's not as bad as she thinks it is but I doubt if that would go over well. But then there's this other checker who is basically my best friend. She's the sweetest little lady and always asks how I'm doing, what I'm baking. I adore her and wish I could figure out her schedule so I can only ever shop when she's working. OK, longest comment ever. This pasta sounds wonderful. Salmon is my favorite fish so I'll have to try this soon! Thank you! It is a delightful combination. OOOOO I love this recipe Thao. I am always on board for easy quick and feel good foods. Especially on weekdays. My son is a huge fan of salmon so he will absolutely love this dish. We can't ever have too many quick and easy recipes up our sleeves, right? I'm so glad this one, Ashika! I would follow it with the frozen hot chocolate. Oooh, that salmon looks so yummy! I love tossing it with pasta and your red pepper sauce sounds on point. As for that cashier, I will say that I do survey the checkouts at my local store and there are couple people I avoid if I can. Thank you Annemarie! This is a great little pasta dish. It's too bad that we feel the need to avoid certain checkout lines. It's bad for business, and the store managers need to be more cognizant of it. I was looking for another way to cook salmon. So I Googled salmon recipes and this popped up. OMG!!! Can I just let you know how AMAZING it turned out? So full of flavor. I followed the recipe step by step. My daughter said it reminded her of a meal she had at Legal Seafood. Imagine that! 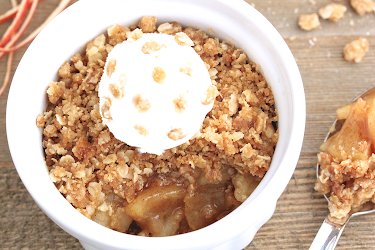 �� I have definitely add this to my recipe book and will make over and over again. Thanks for sharing!